3x5' Nylon Joy Horn Holiday celebration flag. The image is dyed onto 200d nylon heavy-duty, durable outdoor flag fabric and is finished with canvas header and brass grommets. Made in the USA. The flag offers a classic and elegant holiday design. 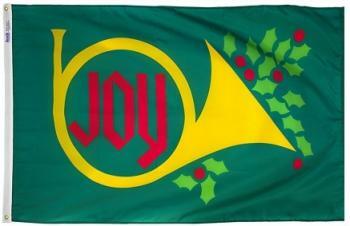 The Joy Horn holiday flag has a holiday green background with a golden horn and holiday holly. In the middle of the horn is the word Joy.